Fabric $1. 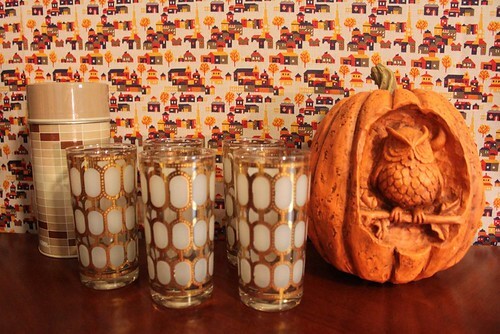 Owl Pumpkin $4. Glasses $1 each. Thermos $2. Die-Hard Horror Fans Rejoice, our favorite time of year approaches! I distinctly remember clambering for the attic like a squirrel on crack at the end of every September, excitedly searching for the boxes full of Halloween goodies. I actually don't have many Halloween decorations of my own, so this weekend I went on the prowl for some. 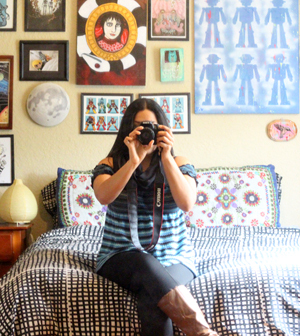 I found cute bits and pieces, I'll cover the rest in future posts. The candy buckets above were .59 cents each. They're lit with small tea lights. Other finds include a couple of retro craft books, an infamous career guide book, and a Japanese designed chicken trivet for my mom. Check back this week for simple Halloween craft ideas and tutorials. None of them should take more than 20 minutes- after all, most of us don't have more than 20 minutes to work on crafts! 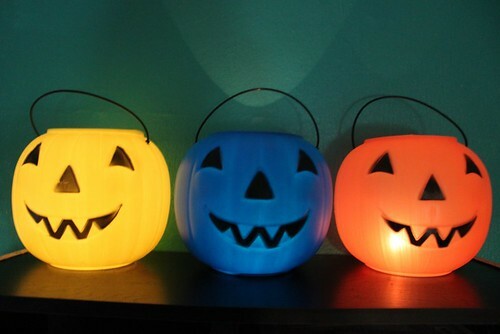 Cute idea with the tea lights in the candy buckets! Love it! Cute idea with the plastic pumpkins. I see tons of those at the thrift stores. Will have to pick some up. Loving those glasses! And for a buck each they are even better! Those are great glasses. I would have picked them up for that price. 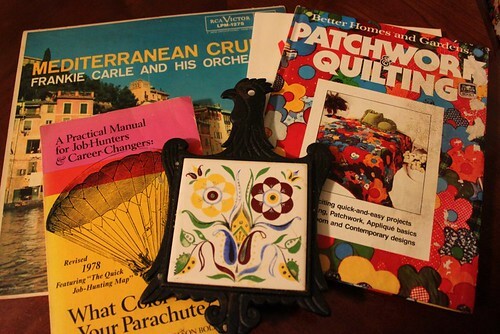 Except for the trivet (which is great) I have everything else in that photo, from before it was vintage. Always fun to see it is not the "trash" my son thinks I collect. I am compiling a list of Halloween events and posts on my art blog. If you want to add your upcoming crafting week, please come over and comment. The glassware and thermos are really cool--I like them mucho! I've been using the glasses for tea, I love them. Can anyone tell what era they're from!